RealD shares debuted at USD $16 when the company first went public but are now languishing at less than ten dollars, so this unsolicited take-over bid should not come as a surprise. RealD Inc. (RLD), the supplier of 3-D technology to cinemas, received a $12-a-share takeover bid from Starboard Value LP, the activist investor that’s pressing Yahoo! Inc. (YHOO) for changes. RealD shares soared. Canada (Quebeq) – French-speaking Canada has a new cinema association: l’Association pour le cinéma sur grand écran (ACGE). 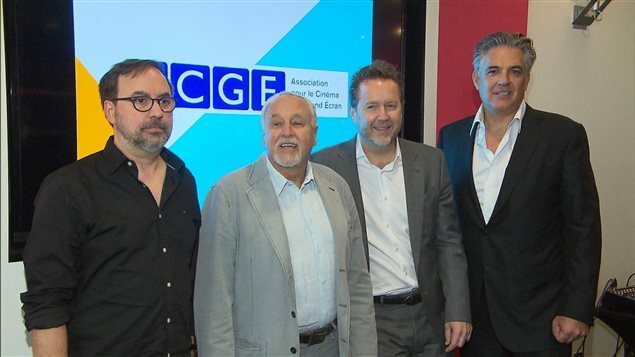 Speakers from all areas of the film industry on the big screen on Wednesday announced the creation of the Association for movies on the big screen (ACGE), whose objective is to promote the cinematic experience. As President, members ACGE elected unanimously Raffaele Papalia, president of Cinemas Cine Entreprise. The former president and CEO of SODEC François Macerola will act as a strategic advisor to the association. France – Le 69e congrès des exploitants du cinéma à Deauville, i.e. the 69th annual conference of French cinema operators has just concluded in Deauville and it seems to have been a positive tone. Canada – An excellent summary and overview of what was discussed and shows at the Giant Screen Cinema Association Conference 2014 in Toronto. Digital is with us, finding its way into the capture process (cameras) with varying degrees of success and in giant screen theaters too (flat screens wider than 70’/21m and domes larger than 60’/18m). And already the next stage is upon us; laser-illuminated projectors, higher frame rates, maybe much higher frame rates and even better digital cameras will drive the quality of the immersive experience up to and probably beyond that of our old friend, 15/70. UK – A community cinema project in the north of the UK gets a re-brand. Cine Yorkshire, a project to improve access to cinema in rural areas and hard-to-reach urban areas of the county has rebranded as Cine North. This will open up the project to 40 venues in Yorkshire and Cumbria. 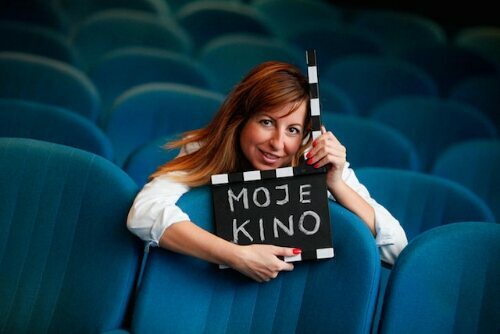 Poland – A long interview with the woman spearheading Poland’s new cinema advertising company Moje Kino (My Cinema). Kinga Do? ?ga-Lesi?ska is a woman dynamite. For years, sitting in the cinema and now wants to sped energy on fighting long advertising breaks. What is the plan? 5 minutes advertising, cheaper tickets, great atmosphere. Will it work? Read the interview with Kinga. Advertisement during the screening. It’s a good idea? USA – Yet another cinema falls under the spell of the liquor demon. The parent company of the Rave Cinema in Huber Heights will renovate the 16-screen cinema and will add beer, wine and frozen cocktails to the concession stand menu, Cinemark officials announced Thursday. Cinemark Holdings, owner of the Rave Cinemas Huber Heights 16 at 7737 Waynetowne Blvd., said the multiplex will offer Luxury Lounger recliners in all auditoriums, an updated lobby and new concession stand and bar area. Plans call for the renovations to be complete in time for the 2015 summer movie season, Cinemark officials said in a news release. Poland – It looks like a possible semi-reprieve for Warsaw’s leading independent cinema, set to close and make way for a clothing shop. The famous cinema Femina may not disappear from the map of the capital. Director. 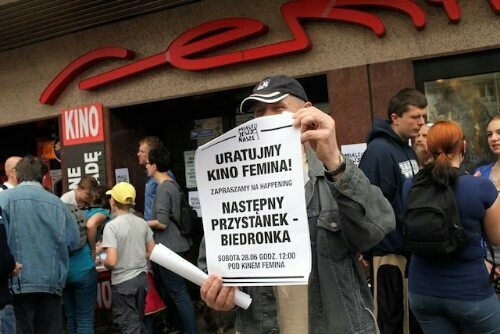 Corporate Jeronimo Martins Poland, Biedronka’s owner, told gazeta.pl was waiting for permission to build the cinema. Jeronimo Martins Poland has never had plans to destroy places of importance to the residents of Warsaw – says in an interview gazeta.pl Alfred Kubczak of JMP. – From the very beginning we wanted to maintain the character of the place – he adds. UK – No word on any possible operator for this proposed cinema yet. Plans to build a £10m art-house cinema and leisure complex in the middle of a Yorkshire spa town have been given the go-ahead by councillors. Canada (ON) – Last year Landmark bought 23 cinemas in Ontario and Western Canada from Empire Theatres. Now Landmark is closing one of them that caters to Indian/South Asian audiences. Square One’s Landmark Cinema, formerly known as Empire Theatre and one of a dwindling number of movie houses left in the city, is closing its doors Friday, Oct. 3. 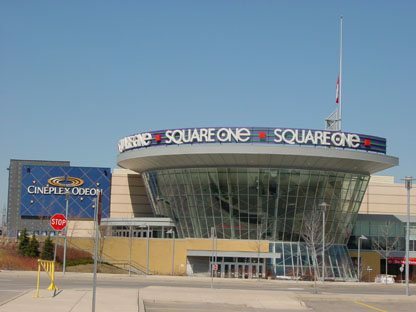 “Landmark Cinemas Canada has strategically decided to end their lease at Square One in Mississauga,” said Brian McIntosh, executive chair of Landmark Cinemas Canada. UK (Wales) – Yet another arts centre with cinema ambitions and a target of 25,000 tickets sold per year plus an economic lift for the area. An arts centre has revealed plans which would see it house two cinema screens and could be up and running in 2016 if funding is secured. Galeri Caernarfon Cyf, a Caernarfon enterprise who have regenerated large parts of the town and are responsible for Galeri in Doc Victoria, have conducted a feasibility study to examine the potential business impacts of having a two screen dedicated cinema on site. Ireland (Rep) – The owner of this planned cinema promises 100 new jobs. According to Omniplex owner Paul Anderson, the eight-screen cinema is scheduled to open in time for Easter next year. Work is progressing quickly at the former Irish Road Motors site at Highfield and it is understood construction is to begin on the main structure next week. Canada – A welcome return for this small Canadian mall cinema with new owners and an ambitious slate. With the Northumberland Mall theatre to re-open as the Rainbow Cinema by week’s end, plans are already underway to retrofit the facility during the first months of operation. Located inside the Northumberland Mall at 1111 Elgin St. W., the cinema will receive upgrades to seats, sound and other amenities to optimize its appeal to regular patrons, according to the new owner, Magic Lantern Theatres. Luxembourg – A welcome cinema opening for town people tired of traveling far to have their big screen treat. For the first time in 50 years, Mersch residents won’t have to travel to see a film at the cinema. Thursday night saw the opening of Ciné Ermesinde in the same location as a school of the same name that opened two years ago.